Silent systems at an affordable price, this is only possible with Phobya! A fan which appeals to both silent enthusiasts and friends of performance systems is something completely new in the PC cooling segment. This split as wel as other unique features make this fan the perfect choice for your system and all competition shake in fear: "Fear IT!" The manufacturer consortium Phobya has achieved a higher rate of air flow without added noise emissions by ideally orienting the fan blades. The curved rotor blades with an angled orientation from bearing to frame are the future of fan design. An innovative bearing and motor design paired with a robust frame and spinner make this a fan which is virtually inaudible. 17 dB(A) are a true please, especially when keeping the air flow of 95 m³/h in mind. Of course this fan can be made even more quiet! Being designed for operation with even lower voltage and having a starting voltage range of 7-12V, this fan can run truly whisper-quiet. And all that whilst ensuring strong cooling performance for your system! Another highlight is the "slim version"! Slim meaning that the fan has a reduced thickness compared other sieries, only 25mm! This allows more mounting possibilities in enclosures, especially in combination with radiators or smaller enclosures. 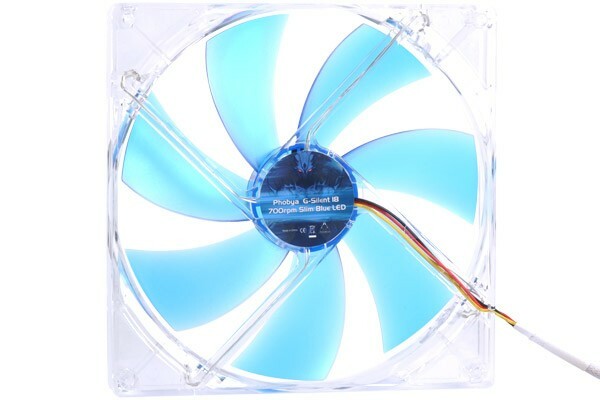 Phobya has created the ultimate fan: Quiet, powerful, with great compatibility and at an affordable price!